Instead of dinner and a movie, there are some alternative local options to celebrate love this Valentine’s Day. At Salt Sensations in Boardman, couples can relax together inside the Oasis Room filled with Himalayan salt during a restorative yoga and salt therapy session. The healing powers of salt were discovered with salt miners in Europe who never got sick. Inside the salt therapy room, a dry aerosol salt is blown in by halogenerators imported from Europe that crush and grind salt. “It’s a modern way to clear sinuses, lungs, skin and your mind,” Salt Sensations owner Tracy Prizant said. Restorative yoga inside the salt room is a “great way to reconnect but to experience it in a way that no one else is offering,” Prizant said. Salt Sensations has two $75 Couples Restorative Yoga and salt-therapy sessions: 6 to 7:30 p.m. Thursday and 10 to 11:30 a.m. Saturday. Youngstown Skate in Boardman has a “Family Fun Skate” that will honor mothers and daughters on Valentine’s Day. The skate goes from 6 to 8 p.m. Admission is $1 and skate rental is $4. 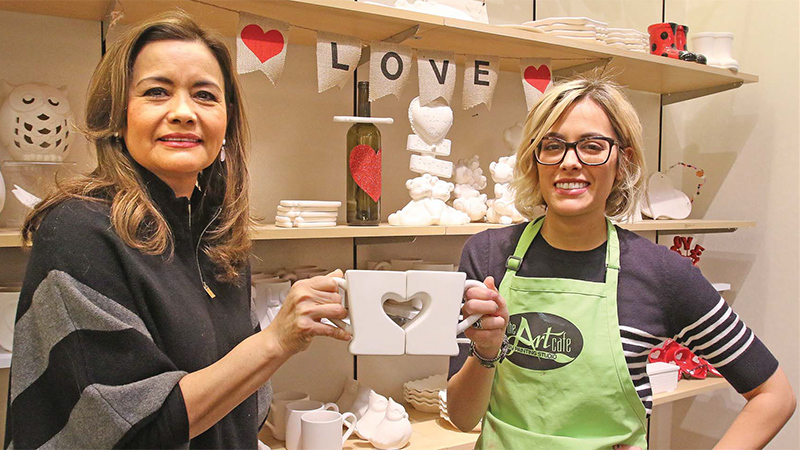 At the Art Cafe inside the Southern Park Mall, there are heart-shaped plates, mugs filled with love, bears and birds for couples or families to paint together on Valentine’s Day. “It’s actually something that is the most meaningful thing you can do or someone you are in love with,” said Eva Popovec, Art Cafe owner. The pottery-painting studio, which also has a mosaics station, will celebrate Valentine’s Day with a complimentary chocolate fountain in the evening. The Art Cafe promotes its Valentine’s Day products as gifts for anyone: significant other, mom, dad, grandma or grandpa. Y-Town Swing will present the “Be My Valentine” swing dance at Cedars West End, 706 Steel St. from 8 p.m. to 1:30 a.m. Thursday. Lessons take place from 8 to 8:45 p.m. and 8:45 to 9:30 p.m. The night will be filled with romantic songs, and after midnight will come some blues tunes. Albani said no partner is needed to attend, and the dancing is for people of all ages. “It’s a great opportunity to meet other people and to gain new friendships,” she said. Youngstown State University is also joining in on the Valentine’s Day fun with a “Galentine’s Dinner” with friends from 4 to 8 p.m. Wednesday at the Christman Dining Commons. For $11.10 per person, students can enjoy an all-you-can-eat celebration. “Come and kick it with your best friend for a Galentine’s Day dinner,” it says on the YSU Student Events Calendar. “After all, what is better than a night of friends celebrating friends?